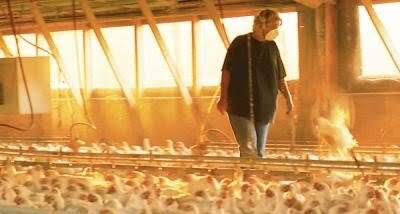 I had to post this great interview with Carole because inquiring minds wanted to know: What happened to the chicken farmer in Food Inc. after she lost her contract with Perdue for speaking out against industrial chicken farming? About CUESA: The Center for Urban Education of Sustainable Agriculture, not only manages one of the most infamous farmers markets in the country - The Ferry Plaza Farmers Market - but this organization hosts sustainable food and farming programming in the Ferry Building as well as putting together their great newsletter each and every week. You can sign up for it by going to their website. If you've seen Food, Inc., you may remember watching Carole Morison walk through her chicken house gathering a handful of sickly, lifeless birds to dispose of. It's a chilling scene, and one that occurred almost daily over the two decades Carole and her husband were contract farmers for Perdue. By the time Food Inc. was made, the Morisons had decided to end their contract with the company and Carole was in a rare position to act as a whistle blower. In the film, she described the harsh conditions for the animals and the people involved in such contracts and shed light on an industry often shrouded in secrecy. Earlier this week, Carole spoke on CUESA's Inside the Hen House panel with Norman and Aimee Gunsell of Mountain Ranch Organically Grown. After the panel, Carole answered a few questions for us. CUESA: By now, many of our readers will have seen you discuss breaking the contract with Perdue in Food Inc. What happened on the farm next? Carole Morison: Since we quit raising chickens we’ve been leasing the land to someone else who grows corn and soybeans. Perdue wanted us to upgrade our facility, which would have cost us $150,000, but we didn’t, so we’re not in the debt we would have been. We’re down to 14 acres. And we’re trying to figure out exactly what we want to do next. CUESA: You had raised chickens for 23 years; that must have been a huge transition. CM: Yeah, my husband has been in it all his life. The land we’re on was part of his family’s original home farm. By the time the contract ended, we both had jobs off the farm, so we were used to getting up early and every day was filled with work. CUESA: You’re still involved as an activist, trying to help folks who are stuck in contracts with big poultry companies. What kind of changes are you advocating for? CM: Agriculture has changed so much. Contracts are really at the forefront, not just with poultry, but with most all [industrial] farming. It’s a dictated policy as to how your farm is run, what you do, how you feed your chickens. For instance going out to buy feed from a source other than the company you contract with — that’s cause for violation of the contract. You have to take what they give you. It’s the same with everything. It’s like the coal mine and the company store, totally controlled. It really has nothing to do with the farmer’s performance anymore. It's more or less the performance of the company’s inputs — the poults or day-old chicks, the feed, medicine, etc. There are new proposed guidelines that the United Stated Department of Agriculture (USDA) is supposed to release for contract farmers. The hope is that this will level the playing field a little. We’re currently working off the Packers and Stockyards Act of 1921. CUESA: What are your thoughts on the recent effort to position people who are proponents of sustainable food as “anti-farmer”? CM: I’ve definitely noticed that and I’d say that’s probably the number one battle plan of industrial agriculture. It has been their way for a long time. Within the poultry industry they also pit farmer against worker; it’s divide and conquer. The fact is these big companies took the farmer out of the equation a long time ago. Now the farmer is trying to take back what was rightfully theirs to begin with. But I do understand the pride folks have, when they’ve put their whole life into this work. Nobody wants to admit that they’re wrong. But I don’t see [the sustainable food movement] as disrespect for the farmer. I view it more along the lines of people finally recognizing what the farmer is stuck in. 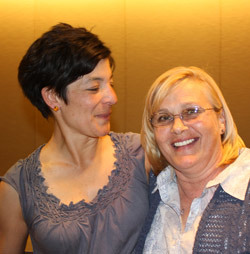 CUESA: You're in a position to act as a bridge between several kinds of people. How did you get here? CM: My first foray into the activism world came through an environmental group — and at that point it was like mixing oil and water. It was a Chesapeake Bay group. I went to one of their press conferences prepared to do battle. And a few comments they made kind of hit home. Something called Pfiesteria had caused large algae blooms in the Bay. It was caused by run-off from poultry manure and it created massive fish kills. The press at the time positioned the farmers against environmentalists and fishermen. But at one point the environmentalists made it clear that they didn’t understand how it all worked. They needed our help and I thought, “if it’s this easy to talk to environmentalists, how bad can anybody else be?” So I think if we all want to survive through what is going on with agriculture, we’re all going to have to give an inch. CUESA: You’ve been in the Bay Area all week; what will you take back with you? CM: One of the things I hear from contract poultry farmers I work with is: how can we manage this enormous debt, cut back on the amount we’re producing, and still survive? I’d had a hard time envisioning how that might be done. Then I spent time on Alexis Koefoed's Soul Food Farm and now I know it’s possible. Their rotational grazing system is great. And it was just mind-boggling for me to see chickens running around outside. We used to raise 54,000 chickens every seven weeks. Even if we’d cut that in half it could have made a big difference in terms of the environmental impact. And heck, with what the farmers are making under contract — an average of four cents a pound — how much worse can it be? I’ve also learned that [changing the system] will take more than separate groups working on separate issues. At the panel, so many good ideas came up — like nonprofit investing in meat-processing infrastructure, for instance. I thought maybe we can throw all these ideas together and come up with a different system! So I have a good feeling about it. I’m beginning to think I just might see it in my lifetime. As a person committed to changing our food system by voting with my fork, I allocate more of my income on food than your average person. In the U.S., the average income spent on food is considerably low, 10%, compared to our European food aficionados, 30%. But until the Farm Bill catches up with the growing demand for sustainably grown and raised foods, we will have to pick up the extra charge on our bills and continue purchasing food that is good for our health, our communities, and our environment. The topic of eating sustainably on a budget is not only timely, but it's something I've been chewing on for the past few years. After all, as a writer, nonprofit professional, and consultant, my financial times have their ebbs and flows. So, in thinking on how to save money on the thing that I value the most - what I eat - I decided to share what I've learned with others. This past weekend at the Green Festival in San Francisco, I spoke about Eating Locally: Save Money While Saving the Planet. The presentation was chalk full of ways that people can reduce their food budget while keeping their dedication to sustainable food intact. (These are tips that I use and am constantly refining.) By walking the audience through the grocery store/farmers market and providing tips, everyone walked away with something new to chew on. Right after finishing Farmer Jane, I had the fortune of having New Year's dinner in the company of Paul Hawkin along with a few of my closest friends. He asked three times, "What's your next book?" At the time it was hard to consider as Farmer Jane is just getting released in May, but the question stuck. 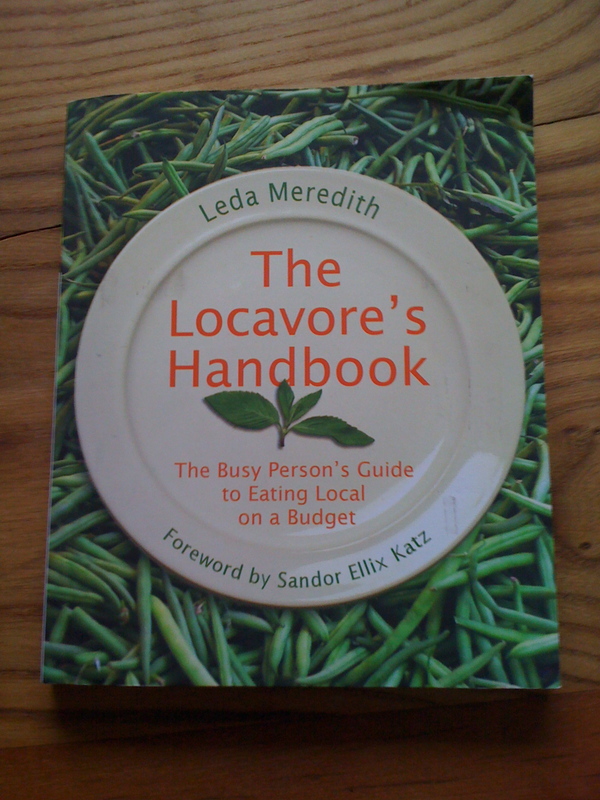 What I came up with was a handbook for eating sustainably and locally. A little quick research on the internet and lo-and-behold! 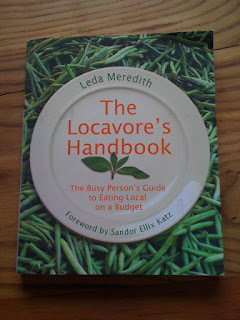 I found Leda Merideth's book:The Locavore's Handbook: The Busy Person's Guide to Eating Local on a Budget. Not only does she cover the many considerations of how to conserve while eating locally but she also includes some recipes, and other how-tos of eating locally. It's a great read and I'm excited that Leda, Deborah Madison, Jessica Prentice, and I will be talking about the subject on June 30 at the Common Wealth Club in San Francisco. Mark your calendars! It's going to be good. In the meantime, follow me on Twitter and FaceBook where I'll post some of these tips and tidbits. 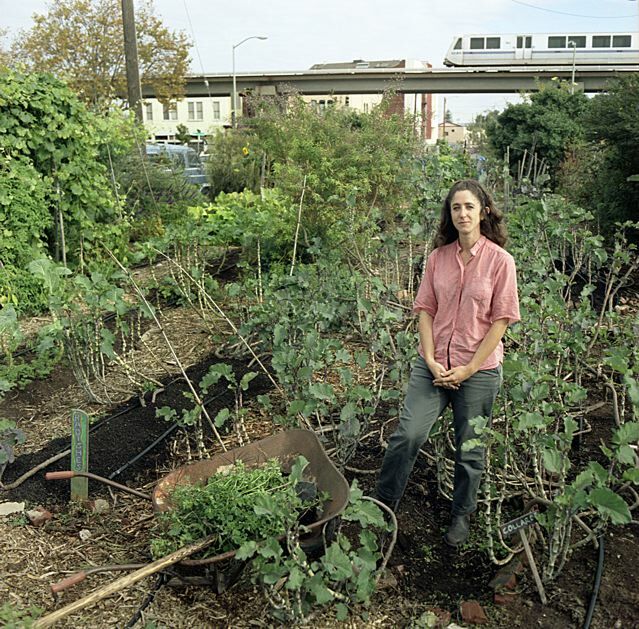 An Office of Urban Ag in the USDA? HR 4971 may sound like the next version of swine flu, but really, it's the new "Greening Food Deserts Act," and a testimony that sustainable food and farming systems have hit the White House full-force. There's a great write up about it on La Vida Locavore's blog, where you're encourage to call, email, and write your representatives to have them sponsor this bill. After being introduced by Marcy Kaptu (D-OH) there are already twenty three co-sponsors in the House! The bill would support urban food projects that are working to help people become more food independent; food banks woud teach food growing skills; schools would be encouraged to teach gardening skills; grants would be made to organizations that are fostering urban agriculture; but most importantly, the bill would create and Office of Urban Agriculture within the USDA. This is big news! Since being copied is a sign of success, we could assume that the sustainable food and ag world is doing something right. However, it means we have to pick up our game, and continue lobbying our representatives to ensure that Monsanto and the relatively few others (DuPont/Pioneer Hi-Bred, Syngenta, and Dow) are challenged every step of the way. We need to continue to make their lives annoying; to hurt their stocks; to educate about the true dangers of these untested and unregulated technologies; to pressure our electeds to speak on our behalf and that of future generations. 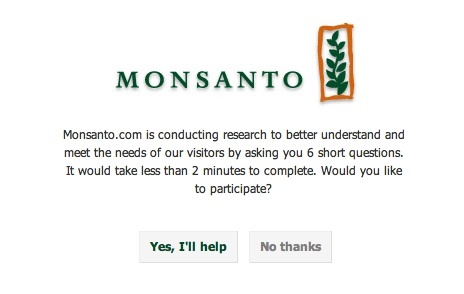 They may have the lingo down, and are heavily using the words "sustainable" and "family farmer," but what they don't have is me, nor the "Millions Against Monsanto," fooled. But Civil Eats did fool me (for a second), when they posted the following: "Monsanto Discontinues MON810, CEO has Change of Heart on How to Feed the World," Sadly, I see some grains of truth to their April Fools post. While they certainly would never cut seed stock that makes them money, they do cut seed stock that they've patented that aren't creating returns for their stockholders. You see, seed is expensive "stock" to carry as the varieties have to be grown out in the field every couple of years. And since they've been busy over the last decade patenting every variety they can get their hands on in nature, this should be deemed a criminal act against humanity. You would think that the USDA would be the stewards of our agricultural biodiversity, but that is simply not the case. They've left the vitality of germ plasm up to the seed and chemical corporations. If a particular stock is not be profitable by the corporation, it gets junked. This is (obviously) a problem since we need to maintain access to genetic diversity to continue to develop a diverse food system that can continue to produce with climate change happening. Seeds hold the answers. I'm glad to say that lately there have been a few harbingers of change. Like this post in the New York Times: "Many biotechnology stocks fell on Tuesday as investors struggled to understand the impact of a ruling that threw out parts of two gene patents and called into question thousands more." Or that the USDA is finally looking into Monsanto's violation of anti-monopoly laws that are even starting to get the corn growers upset. The first hearing in Iowa drew the interest of an estimated 15,000 farmers (read post by clicking here). There will be more hearings to come, mostly where corn growers have been hurt (in the Midwest) since the company has raised their corn seed prices in their forecasting of the profitability of biofuels. DuPont, a competitor, has started the claims. When the big guys duke it out, things get interesting. Until we regain our seeds for the commons (this is really getting into some Amendment language now! ), communities are starting to have seed swaps and groups like the Organic Seed Alliance are building seed interchanges among farmers to regain our hold on what should be a common good.